This presentation was delivered in live webinar format in December, 2015. Stephen’s comments have been edited for clarity and length. 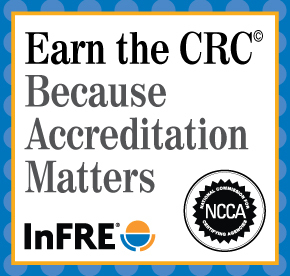 You may also choose to take the full length course to earn 1 CRC®, CFP®, and/or PACE CE credit. As more investors enter retirement, our focus as advisers shifts from the accumulation phase to the distribution phase. It’s a complicated area. 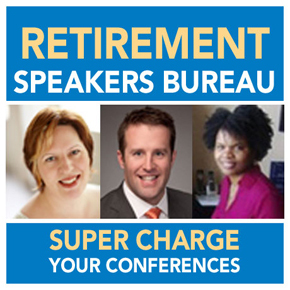 We’ve seen a lot of research, particularly around issues of sustainable retirement withdrawals, and other optimization techniques. So much about investing, saving, and distribution is uncertain. The outcomes tend to be based on the vagaries of the financial markets. The advantage is that much of what we’ll cover here is more predictable. It’s just more consistent ways in which we might be able to add value for our clients. We‘ll even highlight how we can take advantage of uncertainty in the capital markets. Much of what I’ll talk about today is derived from a series of three articles from The Financial Analyst Journal. One is a recent Graham and Dodd award-winning article from 2012 that philosophically lays out key concepts for wealth management, specifically in a taxable framework. The other talks about what I termed “Withdrawal Location” back in 2007. More recently, Kirsten Cook, Bill Meyer, and Bill Reichenstein have an excellent article that takes those drawdown strategies to the next level (March/April edition of the Financial Analyst Journal, 2015). Part of what got me interested in this area to begin with, was that I had a dear family friends whom I was advising, who entered retirement and had a accumulated substantial wealth in tax-deferred vehicles, different Keoghs, IRAs, and things like that, and felt that it was time to start drawing down on those assets because he was entering retirement. He also had substantial assets in taxable structures to draw on as well. There was nothing for me to point him to that said, “Here’s what you should be doing.” Although, I gave him what is essentially the conventional wisdom, which is, “Drawdown your taxable accounts first, and when those are exhausted, drawdown your tax-deferred accounts, and then your tax free accounts as a last resort, preserving the tax sheltering features of those vehicles.” This is the advice you get from Vanguard, Fidelity, and the American Funds. The list goes on and on. Although there could be worse advice, and in fact, this is not bad advice; but it’s definitely not the best advice. We can optimize on it even further. So that’s our goal. Tax-deferred accounts, like traditional IRAs, and 401(k)s, are the economic equivalent of limited partnerships where the government is a limited partner. In consequence, investors end up baring all of the risk and return of the outcomes on the after-tax funds in these tax-deferred accounts. It’s the taxable accounts where things look a little bit different, where government actually shares in some of that risk, and that should affect some of our investment decisions. Here’s what I mean: For a tax-deferred account, if you were to withdraw all of the money today, or all of the money at the end of some time horizon, the government is going to have a claim on the principal value of that account. The investor is then the General Partner. They have a claim on 1 minus the tax rate of all of the assets in that account, and no matter what happens, the government is going to take – if the tax rate is 40 percent, for example – 60 percent of both the principal and the incremental return associated with that account. As a result, investors bare all of the risk and benefit from all of the return, at least on the after-tax corpus associated with that. Maybe the way to illustrate that is if we take a very simple example of $100 in a 401(k), that accumulates a very consistent 5 percent return over 20 years, it’s going to grow to about $260 and change pre-tax, but then we’ll end up paying tax on that at the end, so it ends up getting eroded to about $170 to $190. That would be the equivalent end result as if we just started with $72, and accumulated 5 percent compounded return on it on a tax free basis over 20 years. We get to the same point. So, it doesn’t really matter whether or not the government takes its chunk out early, or whether it takes its chunk out late. That’s different for a taxable account in which the federal or state government essentially has what would be equivalent to a carried interest in the returns associated with the account. The taxing authority does not have a claim on the principal corpus. It’s just on the incremental return. As a result, the investor actually bares less than 100 percent of the risk associated with those returns because the government absorbs some of it. For example, if we have an investor who has a $100,000 portfolio, there are three equally likely outcomes of 25 percent; 10 percent; or a 5 percent loss – that’s a nice, simple 10 percent expected return on a pre-tax basis in a 15 percent standard deviation or volatility. But, if we have a 25 percent return, the government, of course, will tax some of that, so on an after-tax basis it’s really only 15 percent. 10 percent would really get eroded down to 6 at a 40 percent tax rate. But, if we end up suffering a loss, the government would share some of that loss by assuming that we could offset some of our gains with losses. So, the moral of the story is simply that you can see the distribution of after-tax returns is narrower than pre-tax returns. As a result, our standard deviation or volatility is only 9 percent, as opposed to 15 percent. We can calculate, if we want, what that effective tax rate is, or what our effective return is. It depends very much on not just the structure in which the investments reside, but also how those assets are managed. So, if we had a simple scenario in which we had a tax-exempt investor who was earning 8 percent over 20 years on $1,000, it would accrue tax free to about $4,600. Alternatively, you could think of it as an investment strategy that was passive in the sense that the investor buys and holds stocks; they defer tax payments until the very end of this 20 year investment horizon, and as a result, everything is long-term gain, and they’re only taxed at say, 20 percent. They will accumulate less wealth than they would have if they didn’t pay any tax. So, their effective annual tax rate, if it were to be levied on a year after year basis, is 11.5 percent. You could imagine a different investment strategy of an investor who is a little bit more active, in which they trade in a way that all of their gains are taxed annually, 100 percent turnover, but just after that one year mark – so, they get the 20 percent preferential rate, and then their accrual equivalent tax rate would be 20 percent. Or they could trade much more frequently than that, and all of their gains are taxed as ordinary income. Obviously, all of this affects our tax posture. We can calculate that effective annual tax rate by simply setting up the same kind of scenario as we had before: What is the implicit rate of return, or the return that gets us from our pre-tax value to our ultimate after-tax value, depending on how those assets are managed, and what the tax profile is? What are the implications of all of this? 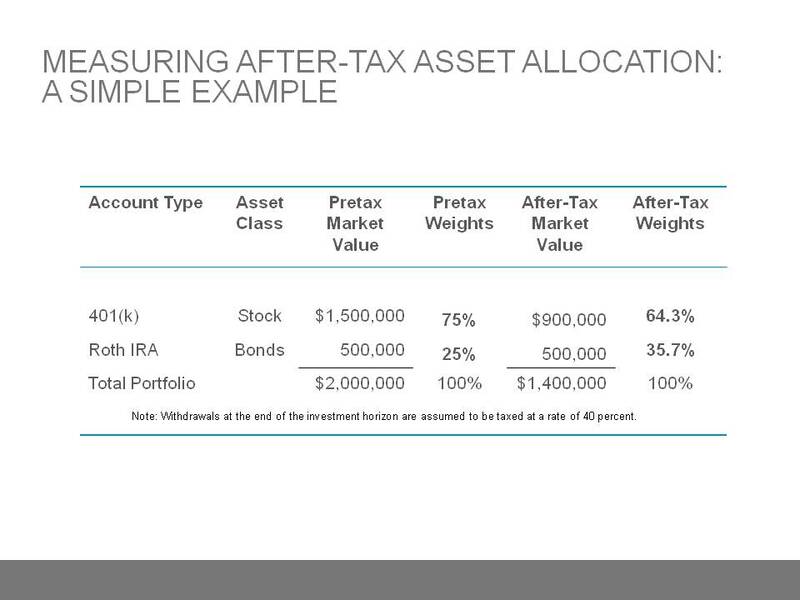 Basically, what it means is that after-tax asset allocation is what ends up really mattering in the accumulation phase. It also means that if we’re going to do a portfolio optimization exercise, it really should be done in an after-tax context, rather than a pre-tax context. 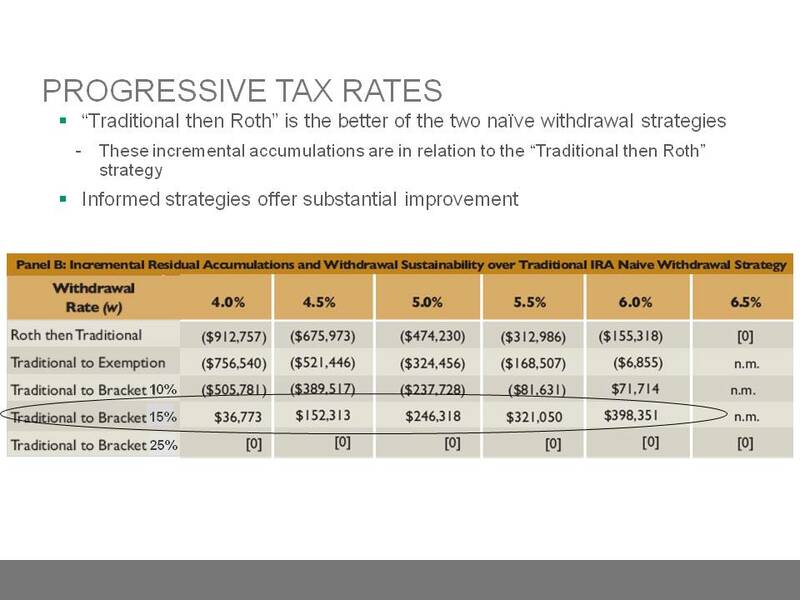 The bottom line is that we want to use multiple tax structures in the accumulation phase so that we have options or tools that we can use in the drawdown phase. In reality, they don’t have $1.5 million dollars available to them in their 401(k) because if they’re taxed at 40 percent, they only have a claim on $900,000 of that. So, their equity portion is really only 64 percent, as opposed to 75 percent. If we were to think about this in an optimization context, taxes also mean that the optimization process is a little bit different. Each combination of asset class and account structure is a unique after-tax asset. The reason is that equity has a different after-tax risk return profile in a taxable account than it does in a tax-deferred account or a Roth IRA. The reason for that is that equity is less risky when it’s in the taxable account because the government absorbs some of that risk. 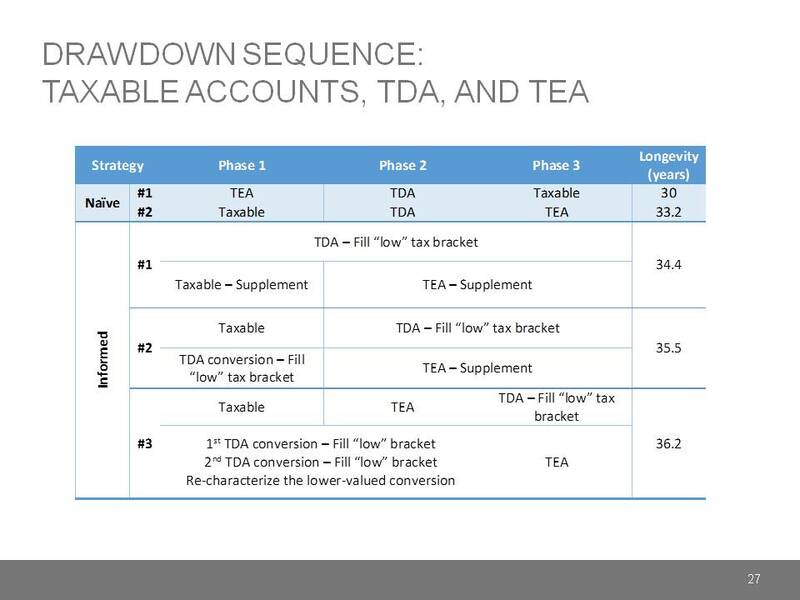 What does all of this mean for the drawdown phase? 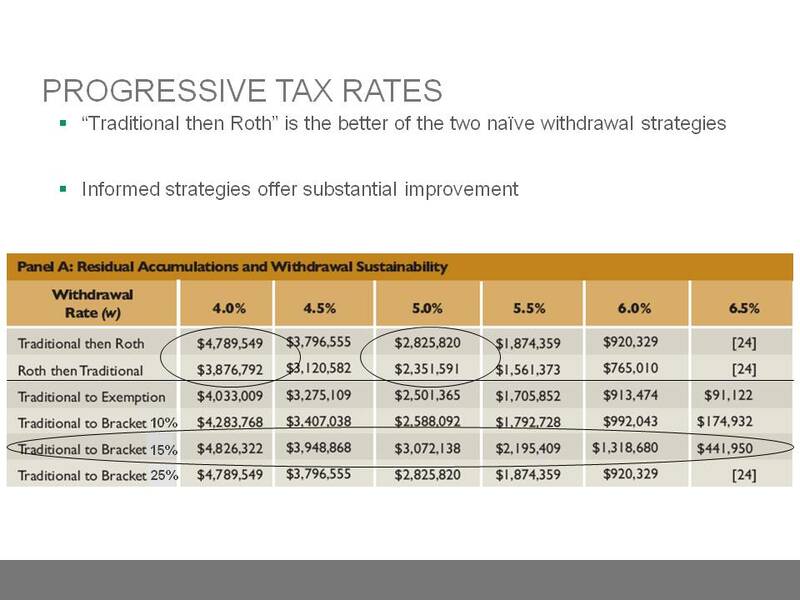 If we create multiple tax structures in the pre retirement phase to provide options in the drawdown phase, these are some of the things that we can think about to give us some guidance on how to use them prior to drawdown. But, once we’re there in drawdown, what we want to do is use our tax brackets strategically. We want to take advantage of conversion and re-characterization options, and also leverage volatility to our advantage. I’m going to start simply just to illustrate a few concepts, and maybe try to add on some more interesting scenarios later on. Assume a very simple two account structure scenario where we only have tax-deferred account like a 401(k), or a tax exempt account like a Roth IRA, and three simple drawdown strategies – two which I’ll call naïve; one of which is the conventional wisdom of drawdown the tax-deferred account (TDA) first until it’s depleted, and then start drawing on the Roth; or the second would be the reverse – drawdown the Roth first, and then the TDA. If we have a very simple tax environment in which the tax structure is flat and tax rates remain constant, then none of this matters. Both of those naïve strategies will produce exactly the same result under all scenarios, and the problem actually becomes very simple. But, in fact the world is not that simple and straight forward. We have a graduated tax system. We have different tax brackets. So, we can look at what I call an “Informed Strategy”. That is to draw on our tax-deferred accounts with taxable distributions that fill up our “Low Tax Bracket”. The goal here is not to minimize our taxes in any given year by shielding as much income as we possibly can from any tax. The goal is really to manage our taxable distributions over the term of the drawdown phase to take advantage of opportunities to get cash out of a tax-deferred account at favorable rates. Then, the question becomes: How can we identify those opportunities? 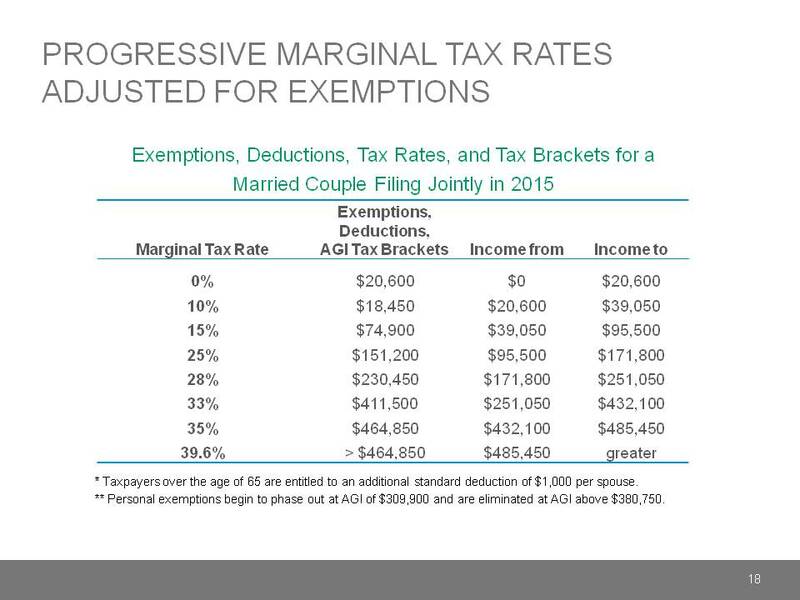 Here is a simple illustration of our current tax schedule for our progressive marginal tax rates. All I’ve done here is adjust it for exemptions and deductions, and in this case it’s just an example of a married couple filing jointly in 2015. What’s kind of interesting is that if we look at this, what we see is that if this couple just does these standard deductions and exemptions, $20,000 of income would never be taxed. In fact, they can have as much as $95,500 of taxable income before they’re taxed anymore than 15 percent on a marginal basis. That’s pretty compelling. That’s actually a lot of income that can be realized at relatively favorable rates. So, those create some opportunities. The best way I know of to illustrate these points isn’t so much with formulas, but with some examples. So, here’s a very simple example of an investor who has $1 million dollars in a traditional IRA, $720,000 in a Roth. They can draw on that at different drawdown rates over a 25 year time horizon, and in a way that has their spending rate adjusted for inflation. With these two naïve withdrawal strategies, which are these first two rows, there, what we see is that depending on the drawdown rate, the conventional wisdom actually does improve the result. The absolute worst thing to do would be to drawdown on the Roth IRA first. And, to the tune of a $900,000 difference, it was about 4 percent, or even a $400,000+ difference if your withdrawal rate was around 5 percent. The reason for that is simply that if we take distributions from the Roth first, we’re missing great opportunities to take advantage of these low tax brackets today, and we’ll end up taking larger taxable distributions down the road, that will be taxed at much higher brackets. Let’s manage that more specifically to those brackets, and look at these different strategies. For this investor, if we just systematically take taxable distributions that fill up our 15 percent take bracket, we can actually add another $250,000 of terminal value in the case of, say, a 5 percent withdrawal rate. One way to look at that is with this chart. This chart just looks at the incremental residual accumulations; how much money is left extra at the end of 25 years for these informed strategies. These are incremental accumulations over and above the conventional wisdom. So, here is that $250,000 incremental residual value I referenced earlier. When added to the $400,000 to $415,000 – that you can add just by not doing the absolutely wrong, naïve thing, which is drawdown the Roth first – that’s an added $720,000 at the end of 25 years, or an extra 8.4 years of withdrawals. That’s pretty substantial. I will say this overstates the case a little bit because I’ve simplified things so much, but I will get to that in just a moment. A natural question or critique would be, “That’s fine. The 15 percent tax bracket works for this investor, but what about other investors?” To be sure, the terms “low” and “high” are relative terms. If I take this same scenario, and double the amount of initial money available on both the tax-deferred account and the tax exempt account, the optimal strategy wouldn’t be to fill up the 15 percent bracket; it would be to fill up the 25 percent tax bracket. That actually corresponds to about $172,000 of income. That’s a substantial amount of income that can be drawn on. We could double those initial wealth endowments again to $4 million dollars and $2.8 million dollars, and in that case, the ideal strategy would be to fill up the 28 percent tax bracket. Not surprisingly, the more wealthy the investor, the higher the tax bracket you would want to fill up. Let’s introduce a taxable account into this scenario. This work is really drawing on the Cook, Meyer, and Reichenstein paper I mentioned earlier. They did a really good job of running through different scenarios. I think the drawback of these scenarios, mine included, is that it doesn’t give you a closed form solution that applies in any and all circumstances, but I think it provides at the very least suggested guidance on things that you can do and the size of the opportunities. Here is their scenario. There are about $1.7 million dollars in total assets, and about 1/2 of that is in a tax-deferred account; about 1/6 of it is in a tax exempt account; and, about $550,000 of it is in a taxable account. If we look at that scenario and assume they take out about 5 percent each year on an inflation adjusted basis, we can look at the outcomes from various drawdown strategies. They look at the two naïve ones that I laid out earlier: doing the tax exempt account first, versus drawing down on the taxable account first. So, that second naïve strategy represents the conventional wisdom. 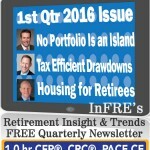 If you run that through to its completion, you can run the portfolio an extra 3.2 years by drawing down on the taxable account first; depleting that; then, drawing on the tax-deferred account; deplete that; and, then the tax exempt account; deplete that – assuming, of course, that minimum distributions don’t get in the way. I’ve split this up into three phases to give you a sense, heuristically, what these different strategies will look like. Before I move onto the informed strategies, it’s probably worth pointing out that the extra 3.3 years of withdrawal sustainability is only a little more than ½ of the benefit that we saw earlier in the two account example. The reason for that is that we have a bunch of the capital here, that is in a taxable account that is inherently less tax efficient, generally, and also crowds out and dilutes the benefit of the other tax preferred structures, as well as some of what I would call the diversity of the tax profiles in those structures – the tax-deferred account having a front end loaded tax benefit, and the tax exempt account having a tax benefit on the back end. Looking at these informed strategies, the first one is the most straight-forward. It’s very analogous to the one we laid out before, and that’s drawing on taxable distributions from the tax-deferred account to fill up a low tax bracket, in this case it’s the 15 percent tax bracket. In the first phase, any additional supplement we would need to get to the required spending of, in this case, $81,000 would come from the taxable account. Over time, we will end up depleting that taxable account with those supplemental withdrawals, and as that happens in phase two, we would still fill up the low tax bracket with taxable distributions, but then supplement from the tax exempt account instead. If we do that, we can add an incremental 1.2 years of longevity to the portfolio, and that’s a fairly modest modification to the strategy. It’s not terribly complicated. But, 1.2 years is about $100,000. So, it’s probably worth the effort. Looking at the second informed strategy is a little bit different. It relates to this notion of using Roth IRA conversions to fill up the low tax bracket. In this case, in that first phase, we would actually draw on the taxable account for our spending, and do these conversions on an annual basis up to the point that they fill up the low 15 percent tax bracket. We keep doing that until we’ve depleted that taxable account and it is no longer available to us, in which case we’re going to use the TDA not to do conversions in phase two and three, but to actually fund our spending, and will supplement from the Roth IRA. It is a somewhat more complicated strategy, but not overly, and that can add another 1.1 years of longevity to the portfolio. 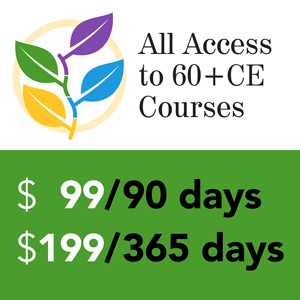 That’s another $90,000 or so in present value terms. Finally, the third strategy they look at is a little bit of leg work, and kind of interesting. What they suggest is kind of a combination of the second strategy and a Roth IRA convert often strategy (in the first phase), drawing on the taxable account for all of your spending needs, and using the TDA to fund Roth IRA conversions that fill up a low tax bracket, and do that with two different buckets. The idea here is to do different conversions that are uncorrelated. They have an equity bucket and a bond bucket. It’s not actually the way I would end up doing it, but it illustrates the point. Over time, you’re going to deplete the taxable account with that, and you will need to draw on the tax exempt account for your spending needs if you are going to continue to do these Roth IRA conversions. The idea is that you would re-characterize them if they end up going down in value, and take advantage of that tax delta, if you will. Finally, in the third phase, eventually you are going to have to use the TDA to fund your spending. You’re not really going to be able to do the conversions anymore. If we go through that effort, we will add an additional .7 years of longevity to the portfolio. It’s a more modest amount, but not unsubstantial, $50,000 in today’s terms, or so. But, it is substantially more effort to do on a year in and year out basis. One of the things that I really need to emphasize is that I strongly advise against implementing any of these strategies without a very close coordination with the retiree’s tax adviser – an adviser who has an intimate knowledge of their tax situation. There are a multitude of tax-related dependencies that could either neutralize the value of some of these techniques, or even make the client worse off. Many of these dependencies revolve around situations that cause a client’s true marginal tax rate to differ from their stated tax bracket. Here are a couple of examples of that: one being how Social Security benefits are taxed. Another one would be the increases in Part B and Part D Medicare premiums as one’s taxable income increases. There are also phase outs of itemized deductions, and personal exemptions that investors face as their taxable distributions increase, as well as increases in the preferential capital gains tax rate. So, all of these are things to be cognizant of as you take taxable distributions. Here’s a quick example called “The Social Security Tax Torpedo”. As most folks know, there is a range of income that will cause 50 percent of one’s Social Security benefits to be taxed. 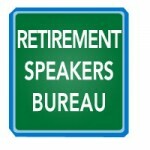 If you go beyond a second threshold, 85 percent of one’s Social Security benefits will be taxed. So, what that effectively does is increase one’s stated tax bracket. For example, if a retiree has $25,000 of Social Security benefits, but no other income, they end up jumping, not to the 10 percent tax bracket, but to the 15 percent tax bracket very quickly around the $35,000 to $40,000 range. Then, rather than jumping to the 15 percent bracket after that, they’re actually jumping up to about 28 percent. It’s actually 27.75% effectively. That’s the torpedo. Once you go through the torpedo, it ends up being a sunk cost, and not really a factor in incremental decision-making, but if you inadvertently push a retiree into the torpedo, you’re actually doing damage. Where that torpedo lays depends very much on their tax situation. Having multiple tax structures available so that one can take a tax distribution when they have an opportunity to have an otherwise low tax rate ends up being very valuable. Hopefully what we’ve been able to communicate here is just simply that taxes affect a lot of things. Fundamentally, they reduce investment risk, at least for taxable accounts, but in that accumulation phase, what we want to be able to do is create and use multiple account structures so that we have tools to use in the drawdown phase. When we are there in the drawdown phase, the taxable drawdowns first is probably the best naïve strategy, if you don’t really want to put a lot of thought into it. In that sense, conventional wisdom could be a lot worse. But, we can definitely do better by filling up these low tax brackets either with withdrawals or using them for strategic conversions of IRAs. 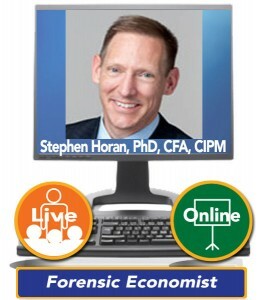 Stephen Horan, PhD, CFA, CIPM, Managing Director, Credentialing, CFA Institute, is a practitioner, educator, and thought leader with 25 years of industry service in multiple capacities. Dr. Horan’s experience includes serving as an expert witness in support of securities litigation, a forensic economist in private practice preparing economic impact studies, a principal of a financial advisory firm, a financial analyst, and as a buy-side account manager and sell-side stockbroker. Dr. Horan has received numerous research grants, and been awarded various honors, including the prestigious 2012 Graham and Dodd Readers’ Choice Award. He has authored or co-authored dozens of articles and books (including The New Wealth Management: A Financial Advisers Guide to Managing and Investing Client Assets).